Sometimes a painting holds far more than just the image, and connections that hold many people together. In October 2011 I posted the original of this painting of deserted cottages along Lake Erie, and told of memories of my mother, selling her house, and finding a “cardboard painting” from my childhood that had clearly been an influence on my style that showed in this painting. A childhood friend I hadn’t seen in decades saw the painting and contacted me because her family spent summers in that very spot. A friend I hadn’t seen since middle school read the story, knew the place where the cottages had been and contacted me. We met and reunited our friendship after 35 years, and she bought the painting because she and her family had spent summers at that place while she was growing up. She had so many precious memories from all those years and the painting brought it all back to her. It also made a nice new bond between us and we regularly communicated after that, hoping to meet for a little vacation at a spot near this place she now visited over summers with her family, but also sharing our love of cats and crochet. Unfortunately, she unexpectedly died in summer 2014. I’ve been remembering since and wondering how she could slip away so soon and unexpectedly when we still had so much to catch up on and find anew, and it always brings me back to this painting. I’m so glad she had it with her for her last three years. She had a part of me with this painting, and I had a part of her with the memory each time I saw it in my portfolio, or as one of the prints I have on hand. I didn’t make it up to Lake Erie to spend time with her, but I will be sure to get to this area and remember her. This is the original story I published in 2011, full of emotional connections as well. My mother had died earlier that year, 2011, and I was also renewing my bond with my art which I had let fall aside while I cared for her in her increasing illness over a decade. Anything can become a learning opportunity and an inspiration, even a cheap cardboard painting stapled into a rickety wood frame. It worked for me. 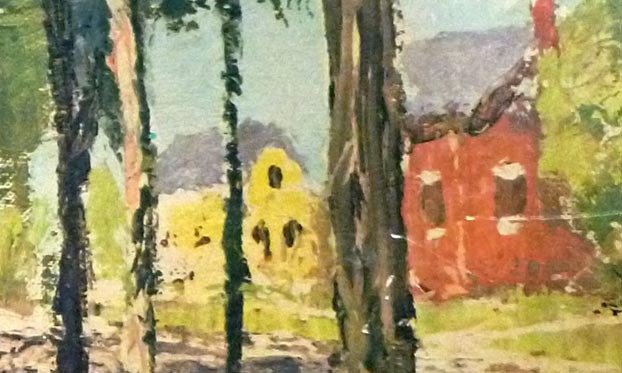 I painted “Deserted Cottages” en plein air at a deserted campground in North East along Lake Erie. It was just a quick thing at the end of the day because the sun was going down and the light was changing fast, but I’d been painting all day and I was well warmed up. I quickly blocked in the buildings with just a few simple shapes and colors and their traceries of shadows, then the trees and grass, trying to catch the fluttering effect of the leaves in the wind allowing chunks of sky to show through, the tree trunks simplified and in high light-dark contrast, the blank expression of the boarded windows. I was pleased with the outcome, yet something was strangely familiar. Six years later I put my mother’s house up for sale as she had moved to personal care, and took down her collection of cardboard art in plastic frames that I’d studied in depth growing up. It may not have been expensive, but there was a lot of it, in every room, including the basement. I particularly remembered the one long narrow painting with the signature J.E. Warfield because I liked the way the trees were leafy, not solid, and opened to the sky, the shadows traced across the ground and the buildings were very simple; after studying it as a child I felt that I could do that, a precursor to my love for Impressionist paintings. Again, something was familiar. I looked at “Deserted Cottages”, and looked at my cardboard Warfield. The tree trunks, the leaves, the simple buildings, the shadows—there it was! I could clearly see what I’d been aiming for as I’d painted six years before—this painting I’d been studying practically all my life. So it was a cheap cardboard painting stapled into a rickety wood frame—never underestimate the power of any image to inspire and teach! And I haven’t found out a darned thing about J.E. Warfield, but apparently this painting was a popular one judging by all the ones I see being sold as “vintage”. Perhaps it’s also inspired many others out there. The original pastel painting of deserted cottages on a Lake Erie beach in Northeast, PA was 17″ x 8.5″ on Rembrandt pastels on Hahnemuhle sanded watercolor paper. It’s monochromatic, the top mat pale gray black core and the bottom raven black white core, the frame 1″ wide solid wood finished matte black. This entry was posted in canvas print, landscapes, nature artwork, pastel, prints of artwork and tagged AUTUMN, deserted cottages, digital prints, framed art, giclee prints of pastel painting, landscape painting, pastel painting on October 15, 2016 by Bernadette.